Storytelling is as natural to humans as eating. We create our myths and epics as a way of expressing our perceived knowledge, sharing what we believe we know about an event or a person. My understanding of my grandfather, Luis, comes from a collection of stories narrated by my mother. Even now, as I read and translate Luis’s poetry and rewrite it as a bilingual dialogue, my responses to his stanzas are certainly influenced by the stories my mother told me of an old man forced to sit in a small room with a typewriter, sharing his visions of Havana, its people, its streets, its paladares, its rhythms, and Cuba Libre. My mother, Rose, was six years old when she left Havana with her two older siblings and relocated to the Bronx. Their father remained in Havana, sending letters and poems to his children. Luis would mail one or two pages at a time to his kids in New York. Because of his political commentary, Luis spent time in prison, where he typed many of the poems that became the premise for the book I am currently writing. Luis was a poet, musician, businessman, and a descendent of Perucho Figueredo, composer of the Cuban National Anthem. My mother tells how a family maid escorted her to see her father at work. Luis owned a brown sugar factory. Much to the dismay of the maid, five-year-old Rosita used her fingers to lick the brown sugar, getting her white dress dirty in the process. Luis, unlike the maid, found his daughter’s antics amusing. My mother tells this story with a kind of childlike pride, where the memory resonates sweeter than the sugar granules on the tips of her fingers. Through Luis’s words, I piece together a lineage woven in cultural history, and I recognize my desire to be a part of a larger family. As I’m reading my grandfather’s poems, I let the words reveal to me his Havana, the Cuba that is as distant from me as Odysseus was from his beloved Ithaca. I long to reconnect to a home from an earlier age, but my longing is blocked by obstacles. The Calypso and Circe of my stories are state policies and an embargo. My grandfather’s poems provide insight into a man I’ve never met and a Cuba that I have yet to set foot on. To the last oak in the last wood. John Casquarelli is the author of two full-length poetry collections, On Equilibrium of Song (Overpass Books, 2011) and Lavender (Authorspress, 2014). He received his MFA in Creative Writing at Long Island University—Brooklyn, and is a member of the literary and art community, the Unbearables (http://unbearables.com/). 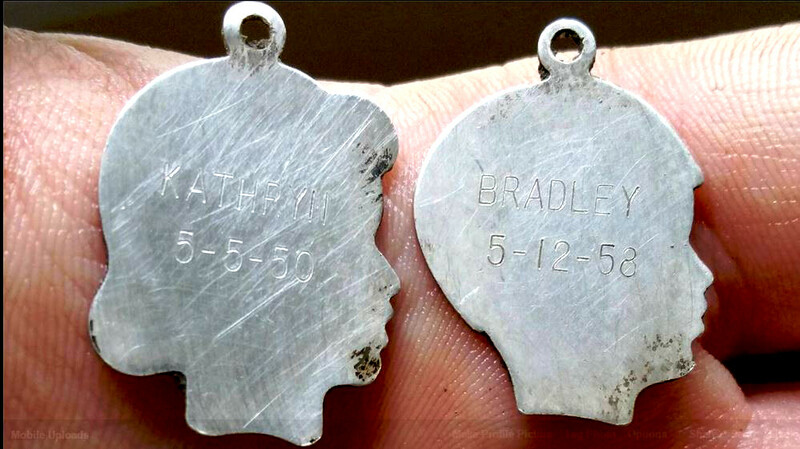 The Facebook headline said, “Any idea who these charms belong to?”–above a photo of two flat metal cutouts engraved with the names “Kathryn” and “Bradley.” If I had seen the post, I would have immediately known, by the names and the birthdates below them, who these people were. In fact, I am surprised that although more than 3000 people shared the post, Facebook did not find anyone who could identify my brother, Bradley. And the metal detectrist who found the charms lives a few miles from the members of my brother’s family, near Poughkeepsie, and most of them are on Facebook. It’s not Facebook’s fault. Bradley started calling himself “Jay,” his middle initial, back in high school. When Gary E. Killmer, Jr., the detectrist, struck out with Facebook and detecting forums, he went to the library in Poughkeepsie to search school yearbooks, with no success. The Internet came through in the end, when he found a website that searches by first name and birthdate, and there was Bradley—who turned out to be Killmer’s insurance agent. Kathryn, our cousin, died in 1996. The two charms were found near the Wappinger Creek, where we swam every summer as kids. When our grandmother was visiting, she used to come along for a dip in the creek, and she must have lost the charms from her bracelet on one of those expeditions. My parents put in a swimming pool in 1974 and stopped going to the creek, so the charms must have been lost over four decades ago. The oldest artifact he has found is the head of an adze—a cutting tool resembling an axe. An archeologist at Vassar College dated the object to somewhere between 3500 and 5000 years old. Killmer’s most valuable discovery was a 1793 Liberty Cap Cent, which he sold for $6000. “I couldn’t justify keeping that one,” he said. Once he located my family, he was excited to return the charms to us. The find was meaningful to me. I had been wondering if it was really worthwhile to keep plugging away at the book I’ve been writing about my ancestors for the last five years. I asked for a sign from the beyond to let me know. Obviously, Grandma thinks I should keep writing. My father died five years ago. Our relationship continues to evolve. Last summer, while brainstorming an exercise for a group at an artists’ and writers’ retreat organized by my friend Bethany Ides, I invented the ancestor interview. It turned out to be a simple but potent process, enabling the living to address the dead. Each person described an ancestor to the group and then conversed with someone who took the role of the ancestor. When it was my turn, I picked my father. I spoke for five minutes, explaining that he was conservative, remote emotionally, yet financially generous. People asked questions, and I described his alienation from his birth family and his dedication to his work. Twenty-five-year-old Stephen offered to impersonate him. When I began to speak to Stephen-as-my-father, I was surprised at how angry I felt. The conversation left me shaken and close to tears, but it was a relief to express my anger, and I felt a deepened compassion for my father. I also realized there was power in this method. Although I have studied with Glenn Leisching, an elder initiated into a West African tribe, I have found it difficult to organize ancestor rituals, the tradition indigenous people use to make contact with their forebears. For modern Westerners, ancestor interviews are more practical. I will be leading an Ancestor Interview workshop at the Historical Society of Woodstock on Sunday, June 28, 2015, at 3 p.m. This event is a benefit for the museum, with a suggested donation of $10. Come and see what gifts your ancestors have for you. 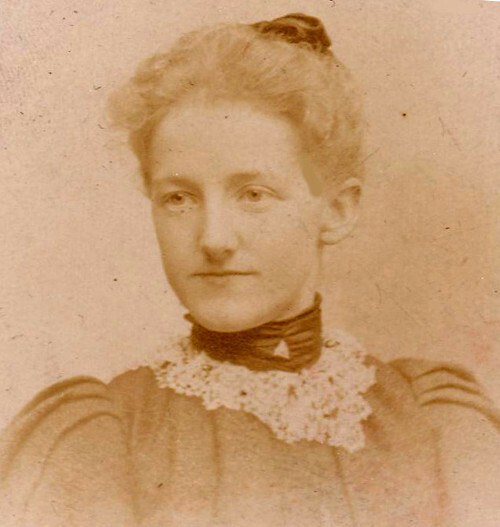 When my great-grandmother, Mary Davies, was 20 years old, she took a trip to Wales with her cousin to visit relatives. 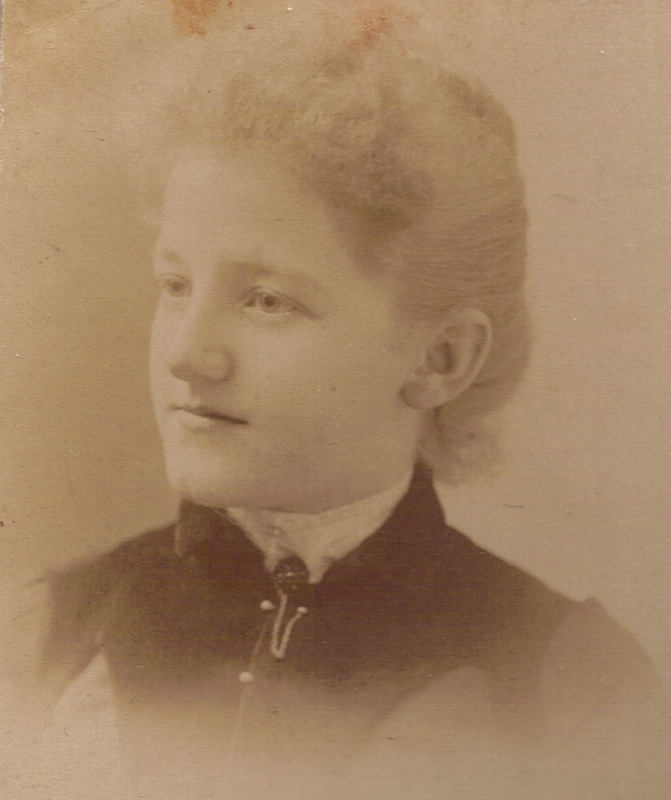 It was 1892, she was petite and pretty, and the Welsh boys flocked to pay court to two exotic American girls. At thirteen, when I first read the diary, I couldn’t figure out why Mary and her friends were constantly taking walks. I’m now realizing that rural lanes were the ideal setting for flirtation, romance, and perhaps the occasional kiss. Having promised Mr. Bevan to go walking with him we all started out at seven o’clock up Swansea road & across the marsh to the old Church. It was a beautiful evening & walking along beside the river we would throw sticks & stones in for Mr. Bevan’s dog Nero to swim after. Mr. Matthias caught up with us…The moon came out bright & full & we had a delightful stroll home, with a package of sweets to munch on. Mary was a proper Victorian girl, so if kissing was involved, she didn’t mention it. However, there are places in the diary where a possible kiss is implied. In the evening Mr. Matthias & Mr. Bevan came, & we all started for a walk….It turned out to be a beautiful evening & the road selected was a lovely, a true lovers lane, with many little curves & turns. We did not get home until eleven o’clock, & although we had walked at least five miles it did not seem that long. Following this passage are two tantalizing sentences in shorthand. Mary had worked as a stenographer at George W. Crane Publishing in Topeka, Kansas, for several years. In those days, the prevalent system of stenography had been invented by an Englishman, Sir Isaac Pitman. By the mid-20th century, Pitman shorthand was largely replaced in the U.S. by the Gregg system. Thus I have not succeeded in finding anyone who can translate the five brief shorthand passages scattered through Mary’s diary. I doubt that their contents are especially racy. But if anyone out there knows Pitman shorthand and would like to take a crack at translation, I’m dying to know what Mary wrote. Email me at violetsnow77@gmail.com. Read more about Mary in this older blog post. It was a dead end st. at both ends – our side dead end was the State Asylum for Insane – burned down when I was about 3 yrs old – Dad had on his blue Army overcoat that next morn when he took me down to see the ruins. In the years that followed we youngsters use to slip thru the fence & play down in the cellars. On the evening of November 18, 1868, the asylum caught fire and was almost completely destroyed. There were three hundred and fourteen patients in the asylum, and six were suffocated by the smoke before they could be rescued. The hospital remained in service until the late 1980s, despite falling into severe disrepair. It was demolished in 1997….Four patient cemeteries of the Columbus State Hospital still exist. Washington Ave. cut Marion St. in half. We lived in the East side…The two East & West never mingled. The East side was a bit more classy – Ha-Hem. She remembers the neighbors as a banker, a contractor, a high school superintendent, a wealthy Irish family. Then the Shedds – large family w/ boys – father worked in bank – cashier – was sent to prison – stole. Ironically, when William later beat his wife with a horsewhip, he was judged by the family to be suffering from stress due to his war experience, which included three months in the infamous Confederate prison at Andersonville. But those mental health issues were years in the future when he stood in his army coat, holding the hand of his three-year-old in the November chill, gazing at the wreckage of the mental hospital down the street. Here is the sequel to the previous post about my husband’s White Russian grandparents. We left Avram Gorelick walking on the road from the Ukraine to Hamburg, having deserted the Russian army on the eve of World War I. He was determined to get to New York in pursuit of his beloved, Lena Arenberg. “His goal was to go 40 miles a day,” said Jack Gorelick, my father-in-law. “He said that in the army, they had a 40-pound pack and were forced to march 40 miles a day.” On the trip to Hamburg, Avram would occasionally hitch a ride on a wagon, but he didn’t try to get on a train. His greatest fear was that he would be sent back to the army, so he took as few chances as possible. Avram arrived in Hamburg, which had a Jewish Bureau, since the port was a departure point for thousands of Jews. There he retrieved his own identity. His brother Kiveh was already in New York, working in a sweatshop. He had bought a ticket and mailed it to Avram. It was the spring of 1914. If war had broken out sooner, he would have been finished—the Jewish brigades were used for minesweeping. The Jewish Currents article about Avram and Lena describes Avram’s life in New York, where he tracked down the Arenbergs. When Lena and her brother, Yankel, contracted tuberculosis, the family moved to Scranton, Pennsylvania, and Avram followed, walking from Hoboken to Scranton along the railroad tracks. After Yankel’s death at the age of 18, Avram–now known as Abe–married Lena. Somehow, Abe’s friend Beryl (see previous post) also made it to Scranton and married Perla, Lena’s sister. Abe and Lena had two sons: Jack and his younger brother, Ben. I’m so lucky that Jack Gorelick has reached the age of 95 and still loves to talk about his ancestors.